The first two installments of this popular animated franchise were set at a hotel dedicated to creating a safe space for monsters to unwind. But what about when the resort owners themselves need a break? 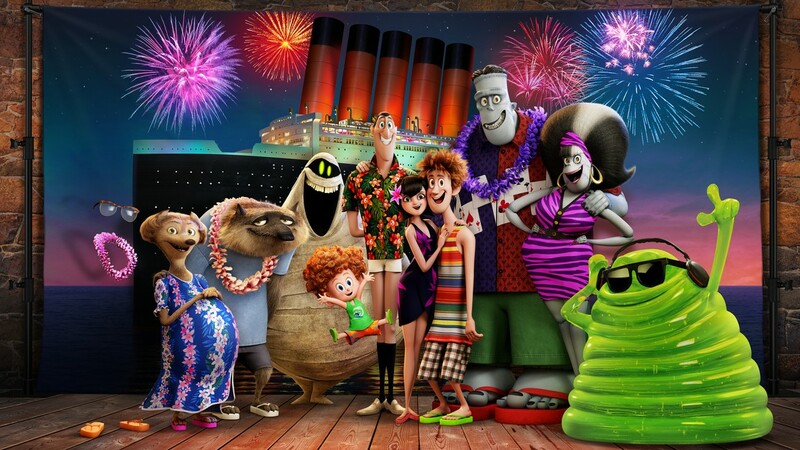 That’s the question posed at the outset of Hotel Transylvania 3: Summer Vacation, an entertaining animated adventure revolving around proprietor Count Dracula (Adam Sandler) and company’s getaway on a luxury cruise for ghouls. At the point of departure, we find Drac’s daughter Mavis (Selena Gomez) making reservations for the family aboard the Legacy, a boat headed for the infamous Bermuda Triangle in search of the mythical island of Atlantis. En route, however, the plot thickens when the widowed Count finds himself being charmed by the ship’s seductive captain (Kathryn Hahn). What Drac doesn’t know is that Ericka is the great-granddaughter of his archenemy, the legendary monster hunter, Abraham Van Helsing (Jim Gaffigan). In fact, he’s already under her spell by the time Mavis and her hubby (Andy Samberg) finally figure out that the attractive captain’s up to no good. Can the hopelessly-smitten Count be saved from the temptress’ plan to spike his guacamole with garlic oil? Or might her mind be changed about the need to subdue the reformed, blood-sucking vampire. Thus unfolds HT3, a kid-friendly comedy directed by Genndy Tartakovsky who also helmed HT1 and HT2. The principal cast members all reprise their roles, including Adam Sandler, Selena Gomez, Andy Samberg, Mel Brooks, Fran Drescher, Kevin James, Steve Buscemi, Molly Shannon and David Spade. While the humor-driven cartoon is laced with lots of side-splitting slapstick and sight gags that are fun for the whole family, what really makes this blockbuster morality play memorable is its timely universal message about tolerance. Hey, it’s okay to be different, and please pass the popcorn!